Why Ayefele's Music House Was Actually Demolished - Oyo Govt. The Oyo State government yesterday insisted that it followed due process in the partial demolition of Music House, the building housing popular musician Yinka Ayefele’s Fresh FM in Ibadan, the state capital. The government said no court order restrained it from carrying out its statutory role in public interest. It said the Music House building contravened the planning laws of the state, adding that the radio station’s management was duly informed about this through several correspondences. The government said its action to demolish the building was neither politically motivated, nor was it an act of vendetta against the radio station, as it continued transmission, despite the partial demolition. The Special Adviser to the Governor on Physical Planning and Development Control, Waheed Gbadamosi, told reporters yesterday the event that led to the partial demolition. Gbadamosi, who was accompanied by the Attorney General and Commissioner for Justice, Mr. Seun Abimbola; the Commissioner for Information, Culture and Tourism, Mr. Toye Arulogun and the Special Adviser to the Governor on Communication and Strategy, Mr. Bolaji Tunji, recalled that during the joint inspection visit to the radio station, government and Music House officials discovered that the building measured 29.7m by 21.6m on ground as against the 11.925m by 10.20m in the survey plan/building plan submitted by Music House. The governor’s aide said this meant a gross overshooting of the allocated size approved with serious legitimacy implications. Chronicling the events leading to the partial demolition, Gbadamosi said: “on May 19, 2017, letters demanding for planning approval were sent to various institutions, including University College Hospital, Kola Daisi University, University of Ibadan and other institutions and organisations. On June 14, 2017, request for approval was sent to Music House and 22 other radio stations in Oyo State. “On August 18, 2017, a reminder letter was sent to Music House and the letter was received by Adebisi Akinkunmi. On August 25, 2017, we went a step further to send a letter to the National Broadcasting Commission (NBC), titled: Operation of Radio Stations without Physical Planning permit/Approval in Oyo State. Few months later, precisely on November 27, 2017, another letter was sent to NBC complaining about Physical Planning Law and Regulations by the radio station owners, developers and operators. “We got a response from NBC on December 4, 2017, and NBC said the issue was outside its mandate. This is to show that the action of the state government is not to witch-hunt anyone, as we even reported the radio stations to NBC. We also wrote to the Central Bank of Nigeria (CBN) on some banks contravening the Oyo State Physical Planning and Development Control laws, sections 30, 31 and 32 of the Oyo State Physical Planning and Urban Development Law of 2012. He said the building plan from Music House deviated from the approved plan, which made the approval null and void. According to him, deceitful information was given to the approving authority and a deviation from the approval granted in construction and use. 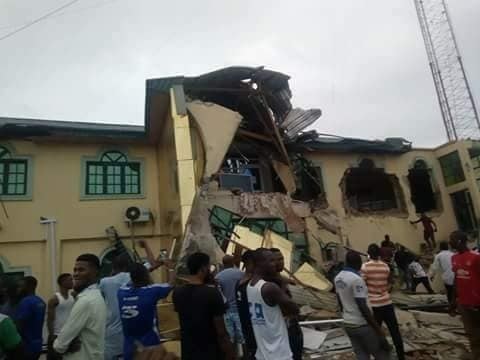 Also, the state government yesterday chronicled the events that led to the demolition of Music House, the building housing Fresh FM, a private radio station belong to popular musician, Yinka Ayefele. A statement in Ibadan, the state capital, by the Special Adviser to the Governor on Physical Planning and Development Control, Waheed Gbadamosi, gave a list of the events that culminated in last weekend’s action. May 19, 2017, letters demanding for planning approval were sent to various institutions including UCH, Kola Daisi University, University of Ibadan and other institutions and organisatons. June 14, 2017, request for approval was sent to Music House and 22 other radio stations in Oyo State. August 18, 2017, Reminder letter was sent Music House and the letter was received by Adebisi Akinkunmi. August 25, 2017, a letter was sent to NBC titled Operation of Radio Stations without Physical Planning permit/Aprroval in Oyo State. November 27, 2017, another letter was sent to NBC complaining about Physical Planning Law and Regulations by the Radio station owners, developers and operators.